Non-Western academics would tend to come from social contexts that already have had a lot of influence form Western countries (and this influence is likely to have increased through their education, both before and at the university) (2013, 63). I agree that the non-Western scientific community “already has had a lot of influence from Western countries” (63) particularly when they use English as “international working language” for conducting research and communicating with foreign colleagues in the same community. But, when the whole set of knowledge in a scientific microworld has been translated into non-Western languages, it is very easy to beware of the distinction between scientific microworld and lifeworld, particularly in the field of psychology. When the scientific microworlds of mainstream Western psychology were translated and exported to non-Western countries, many scholars and practitioners in non-Western countries found them to be irrelevant, incompatible, or inappropriate to understanding the local population. Knowledge generated by Western psychology cannot be used to solve their daily problems. This is the main reason some psychologists decided to develop indigenous psychologies in reaction to the dominance of mainstream psychology. [T]here is no identifiable essence of a tradition that gets carries across all the groups of people that belong or claim to belong to the tradition and that can help to decide disputes about membership (Ruben, 2013, 25). Since devoting myself to the social science indigenization movement in the 1980s, I soon realized that the fundamental barrier for Chinese social scientists to make a genuine breakthrough in research is a lack of comprehensive understanding on the progress of Western philosophy of science, which is the essential ethos of Western civilization. All the knowledge sought and taught in Western colleges has been constructed on the grounds of Western philosophy. In order to help Chinese young scholars understand the progress of the Western philosophy of science, I spent more than ten years writing “Logics of Social Sciences” (Hwang, 2001/2013), which addresses different perspectives on crucial issues of ontology, epistemology and methodology proposed by eighteen representative Western philosophers in the twentieth century. The first half of this book addressed the switch in the philosophy of natural science from positivism to post-positivism. The second half expounded the philosophy of social science including structuralism, hermeneutic and critical science. Once the philosophy of science has been systematically introduced into a particular non-Western culture, the historical reality of its transmission in that culture is of perpetual fission. Some may use it to construct scientific microworld, some may use it to settle disputes among members of the same scientific community. Professor Hwang’s tendency to see cultures as fairly well-integrated, isolated bodies of understanding with essential deep-structure components might be behind his tendency to emphasize the difficulty of persons from various parts of the world to understand one-another. Obviously, Prof. Allwood does not know (or does not believe) that there is an essential “deep-structure” behind scientific knowledge. Bhaskar (1975) proposed a conceptual scheme which classifies philosophies of science into three broad categories: classical empiricism as originally proposed by David Hume (1711-1776), who regarded atomic facts as the ultimate objects of knowledge; their combinations constitute all the events which are objective for us to recognize the external world. The logical structure of elementary proposition states relationships among names of objects are supposed to be isomorphic with atomic fact in the objective world. Radical empiricists conceptualize scientific knowledge as an individual’s behavioral responses to the stimuli of some events. Though logical positivists do not accept such approach of behaviorism as the only method for creating valid scientific knowledge, they still insist that the valid content of science must be reduced to such empirical facts and their combinations (See Figure 1). The second category consists of transcendental idealism proposed by Kant and the various versions derived from it. According to this school, the goal of scientific activities is the construction of theoretical models to depict the natural order. Hence, theoretical models are constructed by scientists; though they might be independent from any particular individual, they cannot be independent from the scientific community. According to this school, scientific research aims to find the underlying structure from manifested phenomena, the constant association among events is the necessary but not sufficient condition for deriving natural law; knowledge about the natural world thus becomes a construction of human minds. The modern version of this school argues that scientific knowledge is constructed by the whole science community. The third school of transcendental realism argues that scientific activities aim to find the structure of mechanism for producing the phenomena. The objects of scientific research are neither the phenomena (empiricism) nor the constructs imposed on the phenomena (idealism), but the real structures that exist and operate independently from our knowledge. According to this perspective, the world exists independently from our knowledge about it. Both the world and our knowledge about it have their own structures which can be differentiated and are changing constantly. Science is not an epiphenomenon of nature, and nature is not a product manufactured by human beings. Allwood seems to be an empiricist because he advocates for the advantage of an empirically oriented cultural concept in indigenous psychology research. Classical empiricists insist that sensory experiences should be the only source of scientific knowledge. They regard empirical facts as the only reality for scientific research and do not believe in any explanatory ideas, conceptions, or “deep structures” behind the empirical phenomena. In the history of psychology, the school of behaviorism takes the philosophical position of radical empiricism. They elude cultural issues by excluding consciousness from psychological study. Culture has no position at all in behaviorists’ total scheme of investigation. Since people’s conceptions are important for their reactions and actions, a good understanding of the conceptions (understanding), etc. of the persons to whom the research results are to be applied is likely to increase the chances for successful application of the results. For this reason I argued that it is important for IPs to take an interest in what the actual cultural understanding of various segments of the population of their society is. Thus, I advocated a culture concept that recognizes the distribution and heterogeneity of the understanding held by people in the society in question (60). Here “people’s conceptions” obviously mean “the understanding held by people in the society in question.” Unfortunately, most psychologists are doing research with “conceptions” utilized in the scientific microworlds that had been constructed by Western mainstream psychologists, but not “conceptions” held by people in the society in question. Conceiving in terms of Bhaskar’s (1975) scheme of classification, when the trend of mainstream psychology switched from behaviorism to cognitive psychology, the philosophical ground also changed from the radical empiricism of positivism to transcendental idealism. 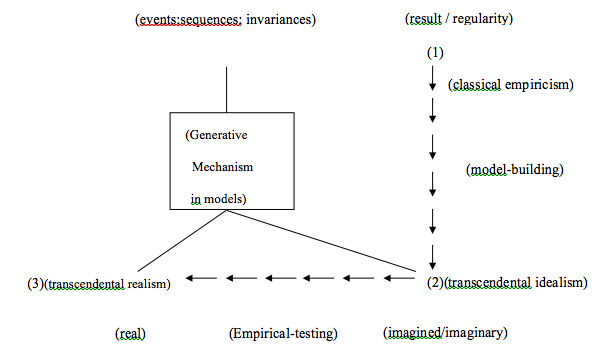 They have to speculate the meaning of observed phenomenon by using transcendental ideas or conceptions that may represent cultural reality (See Figure 1 above). Allwood advocates for the advantage of an empirically oriented cultural concept. He is not a behaviorist, and he rejects the construction of scientific microworld by either transcendental idealism or transcendental realism (See Figure 1 above); thus his philosophical stance should be posited as naïve empiricism. As I mentioned in my last article (Hwang, 2013), almost all conceptions used by mainstream psychologists originated from samples of the WEIRD (Western, Educated, Industrialized, Rich and Democratic) social group (i.e. college students in Western countries), and most psychologists assume that theories of Western psychology are universal and can be applied everywhere in the world. Henrich, Heine & Norenzayan (2010 a, b) reviewed the comparative database in the behavioral sciences, and found that the WEIRD subjects are particularly unusual compared with the rest of the species across diverse domains, including visual perception, fairness, cooperation, spatial reasoning, moral reasoning, reasoning styles, self-concepts and related motivations, and the heritability of IQ. They thus concluded that there is no obvious a priori ground for claiming that such a particular psychological phenomenon is universal based on the sampling of such a single subpopulation. In order to put theories of human behavior and psychology on a firmer empirical footing, they suggested that granting agencies should prioritize cross-disciplinary and cross-cultural research; researchers must strive to evaluate how findings of their research apply to other population; reviewers and editors of academic journals should give researchers credit for comparing diverse and inconvenient subjects and push them to support any generalizations with evidence. Nevertheless, suggestions of this kind advocates for an approach of studying the psychology of non-WEIRD populations in the theoretical contexts of mainstream psychology, which represents a perspective of cross-cultural psychology, but not cultural psychology or indigenous psychology (Shweder 2000). Therefore, I strongly object to this approach and advocate for the construction of culture-inclusive theories of psychology. Thus, I would conclude (and it seems reasonable to assume that professor Hwang would also agree), that it is of relevance and importance for the IPs, in order to strengthen the applicability and usefulness of their research results, to carry out empirical studies of the culture of their own societies in order to find out how the understanding of people in their society is distributed over various categories of people living there. Allwood’s conclusion seems plausible. But, the crucial questions to be asked here are: how to study the “understanding” (conceptions) of people in their society? What instrument should be used to measure their understanding (conceptions)? On what theoretical ground has the instrument of measurement been constructed? How are the findings of empirical research interpreted in the context of a particular scientific microworld? What kind of concepts are used to represent the transcendental reality (see Figure 1 above)? Given the fact that most scientific microworlds of mainstream psychology had been constructed on the basis of samples from WEIRD societies, how can we explain results of “empirical studies of the culture of their own societies in order to find out how the understanding of people in their society is distributed?” How can we do this without culture-inclusive theories? Adherence to the ideal of “a universal psychology” seems almost as common as a rejection of the “individualism” of Western psychology. Yet, in the history of Western psychology, individualism and the search for universal laws have been closely linked: Psychological laws would be considered universal insofar as they applied to all individuals along a common set of dimensions. Is it possible to break this link between individualism and universalism, as the remarks of several contributors seem to require (2006, 272)? For the sake of untangling the link between individualism and universalism, it is necessary to find an alternative mechanism of social interaction to replace individualism and demonstrate that it represents the “deep-structure” of universal mind, which might be termed “generative mechanism” in Bhaskar’s (1975) Philosophy of Critical Realism (see Figure 1 above). Unfortunately, Allwood doesn’t believe that culture has a deep structure of core understanding just as he doesn’t understand that science also has a deep structure because he is bound by naïve empiricism. The culture concept advocated by Prof. Hwang as suitable for the IPs focuses on the shared understanding in a society, and assumes that cultures by definition have a deep-structure of core understanding and that cultures change slowly over time. Thus, culture in Prof. Hwang’s approach tends to become somewhat reified. His approach also seems to include a belief that it is meaningful to attempt to characterize “the particular mentality of people within a given society” (8), and idea that has been much criticized in the last decades. Hwang’s culture concept also assumes that cultures change slowly over time and that they go through periods, or phases, where they are more or less influenced by understanding form other societies and contexts. Prof. Hwang, via a quotation form John Berry (9), seems to argue that this type of culture concept is an emergent view in anthropology. This is not my impression of recent developments in social anthropology (61). The incorporation of culture into mainstream psychology will not come from simply presenting data on group differences, no matter how exciting or dramatic these differences may be. My most important theoretical mission is to introduce the idea of a deep structure of culture. As in language, deep structure of culture generates behaviors and interpretations of human behavior in an infinite array of domains and situations. I believe that the concepts behind individualism and collectivism, independence and interdependence, a relational vs. an individual orientation and so on are all indexing a common deep structure (Greenfield 2000, 229). In other words, what psychologists should do is to assume that the deep structure of human mind as well as its psychological functioning do not vary across different cultural populations, but that people living in different societies may develop various mentalities in response to diverse cultural contexts (Berry et. al., 1992; Poortinga, 1997). The goal of universal psychology or global psychology, which can be attained, is to construct a series of formal theories which can reflect both the universal deep structure of the human mind and the specific mentalities of people in a given culture. This will allow us to understand the manifestations of people’s mentality within their cultures in terms of a larger common framework. Allwood and J. W. Berry (2006) also recognized that western mainstream psychology is a kind of indigenous psychology. Therefore, theoretical construction in western psychology also implies a reification of culture. My central question is, then: why is the reification of the western culture of individualism a merit for the progress of psychology, and why the reification of non-western cultures by indigenous psychologists a mistake (Hwang 2011, 125)? At that time, my book has not been published in English yet. In the third round of our debate (Hwang 2013a), I had suggested him to read my newly published book entitled Foundation of Chinese Psychology: Confucian Social Relations (Hwang 2012), which shows my effort in striving to attain the epistemological goal of IP. Based on the philosophy of post-positivism, this book emphasized that the epistemological goal of indigenous psychology is to constitute a scientific microworld by a series of theoretical models that may represent the universal mind of all human beings as well as the specific mentalities of people in a particular culture. With such a premise, I explained how I constructed the theoretical model of Face and Favor, and used it as a framework to analyze the inner structure of Confucianism. I reviewed previous researches on Chinese moral thinking and moral judgment, and discussed the features of Confucian ethics from various perspectives. Then, I constructed a series of culture-inclusive theories to integrate findings of previous empirical researches on social exchange, face dynamism, achievement motivation, organizational behavior, and conflict resolution in Confucian society. Figure 2: A theoretical model of face and favor in Chinese society (adopted from Hwang 1987, 948). 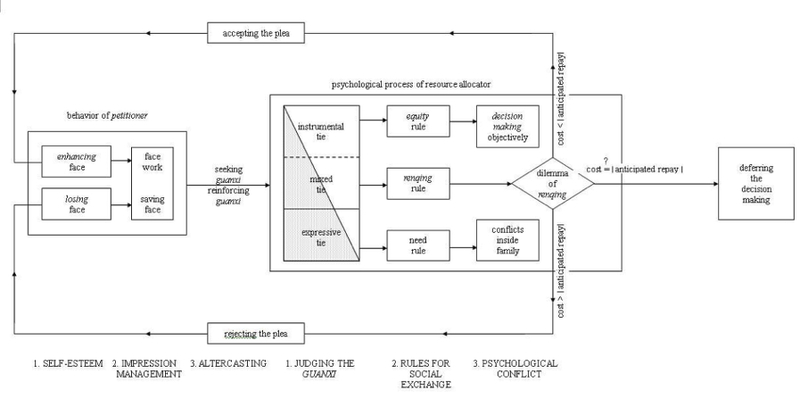 In Figure 2, within the box denoting the psychological processes of the resource allocator, the shaded rectangle represents various personal ties. It is first divided into two parts by a diagonal. The shaded part stands for the affective component of relationships, while the unshaded part represents the instrumental component. The same rectangle denoting guanxi (interpersonal relationships) is also divided into three parts (expressive ties, mixed ties, and instrumental ties) by a solid line and a dotted line. These parts are proportional to the expressive component. The solid line separating expressive ties within the family and mixed ties outside the family indicates a relatively impenetrable psychological boundary between family members and people outside the family. Different distributive justice or exchange rules are applicable to these two types of relationships during social interactions. In expressive ties, the need rule for social exchange should be adhered to and people should try their best to satisfy the other party with all available resources. In mixed ties, following the renqing rule, when individuals want to acquire a particular resource from someone with whom they have instrumental ties, they tend to follow the equity rule and use instrumental rationality. In Chapter 4 of my book, I elaborated on the meaning of the renqing rule in Chinese society and argued that if it is conceptualized as a special case of equality rule, which emphasizes that once an individual has received favor from another, s/he is obligated to reciprocate in the future, then the Face and Favor model can be viewed as a universal model. Is there any evidence to support my argument? Fiske (1991) argued that these four relational models are fundamental to the social life of human beings. Fiske carefully examined the manifestations of these four relational models in various domains of social life and their characteristics. In addition to the reciprocal exchange, distributive justice, and contribution as previously described, the domains being examined also include work, meaning of things, orientation to land, social influence, constitution of groups, social identity and the relational self, motivation, moral judgment and ideology, moral interpretation of misfortune, aggression and conflict, etc. This fact implies that these structures are derived from the same set of psychological schemata, or the universal deep structure of mind. Comparing the four elementary forms of social behaviors with my Face and Favor model, it can be seen that the three kinds of social behaviors, communal sharing, equality matching and market pricing, are correspondent with the three kinds of interpersonal relationships in the Face and Favor model; namely, expressive tie, mixed tie and instrumental tie. In terms of constructive realism (Wallner 1974), this means the terminology of the Face and Favor model can be stratified into Fiske’s theory of relational models. In consideration of the power distance implied in the relationship between a petitioner and resource allocator, it can be conceptualized as authority ranking in terms of Fiske’s (1971) taxonomy. From the perspective of anthropological psychology, Fiske (1991) pointed out that: the four elementary forms of social behavior represent the universal mind for dealing with interpersonal relationships found in every culture around the world. From this point of view, Western individualism has over-exaggerated the relationship of market pricing or instrumental tie, while ignoring other kinds of interpersonal relationships. This is undoubtedly a bias. From the perspective of structuralism, any theoretical model constructed on a biased presumption will inevitably suffer from crises of infinite regress. In contrast, any psychological theory that has been constructed on the presumption of universal mind will be more robust to withstand the examination of empirical research. The problem with a multiple philosophical paradigms approach is of course that it introduces the possibility of more degrees of freedom in the reasoning and that the reader may not always know which philosophical paradigm or combination of philosophical paradigms is used at a particular occasion in Prof. Hwang’s writing. This makes it difficult to trace the meaning of his concepts in a systematic way. In addition, as his approach is composed by his own personal mix of various philosophies it is congruent that he repeatedly stresses that his research approach is “unique”. When you know a thing, to hold that you know it. When you do not know a thing, to allow that you do not know it. Allwood, Carl Martin and John W. Berry. 2006. “Origins and development of indigenous psychologies: An international analysis.” International Journal of Psychology 41 (4): 243-268. Allwood, Carl Martin. 2013. “On the Advantages of an Empirically Oriented Culture Concept in the Indigenous Psychologies.” Social Epistemology Review and Reply Collective 2 (8), 60-65. Bhaskar, Roy, Margaret Archer, Andrew Collier, Tony Lawson, Alan Norrie, editors. 1975. Critical realism: Essential readings. London: Routledge. Bhaskar, Roy. 1975/1997. A realist theory of science. London: Verso. Berry, John W., Ype H. Poortinga, Seger M. Breugelmans and Athanasios Chasiotis. 1992. Cross-cultural psychology: Research and applications. Cambridge: Cambridge University Press. Danziger, Kurt. 2006. “Comment.” International Journal of Psychology, 41 (4): 269-275. De Laet, Marianne. 2012. “Anthropology as social epistemology.” Social Epistemology 26 (3-4): 419-33. Fiske, Allan P. 1991. Structures of social life: The four elementary forms of human relations. New York: The Free Press. Greenfield, Susan. A. 2000. The private life of the brain. London: Penguin Books. Henrich, Joseph, Steven J. Heine and Ara Norenzayan. 2010a. “The weirdest people in the world?” Behavioral and Brain Sciences 33 (2-3): 61-83. Henrich, Joseph, Steven J. Heine and Ara Norenzayan. 2010b. “Beyond WEIRD: Towards a broad-based behavioral science.” Behavioral and Brain Sciences 33 (2-3): 111-135. Hwang, Kwang-Kuo. 1987. “Face and favor: The Chinese power game.” American Journal of Sociology 92 (4): 944-974. Hwang, Kwang-Kuo. 2001/2013. The logic of social sciences. (Chinese) Taipei: Psychological Publishers. Hwang, Kwang-Kuo. 2011. “Reification of culture in indigenous psychologies: Merit or mistake?” Social Epistemology 25 (2): 125-131. Hwang, Kwang-Kuo. 2012. Foundations of Chinese psychology: Confucian social relations. New York: Springer. Hwang, Kwang-Kuo. 2013b. “The construction of culture-inclusive theories by multiple philosophical paradigms.” Social Epistemology Review and Reply Collective 2 (7): 46-58. Lakatos, Imre. 1978. “Popper on demarcation and induction.” In The Methodology of Scientific Research Programmes, 139-167. Cambridge, UK: Cambridge University Press. Poortinga, Ype. H. 1997. “Towards convergence.” In Handbook of cross-cultural psychology, Volume 1, 2nd edition, edited by John W. Berry, Janak Pandey, Ype H. Poortinga, 347-387. Boston, MA: Allyn & Bacon. Shweder, Richard A. 2000. “The psychology of practice and the practice of the three psychologies.” Asian Journal of Social Psychology 3 (3): 207-222.